Peak Edge Hotel Derbyshire Wedding Photography on St. Valentines day! We refer to this image as "Boo!". 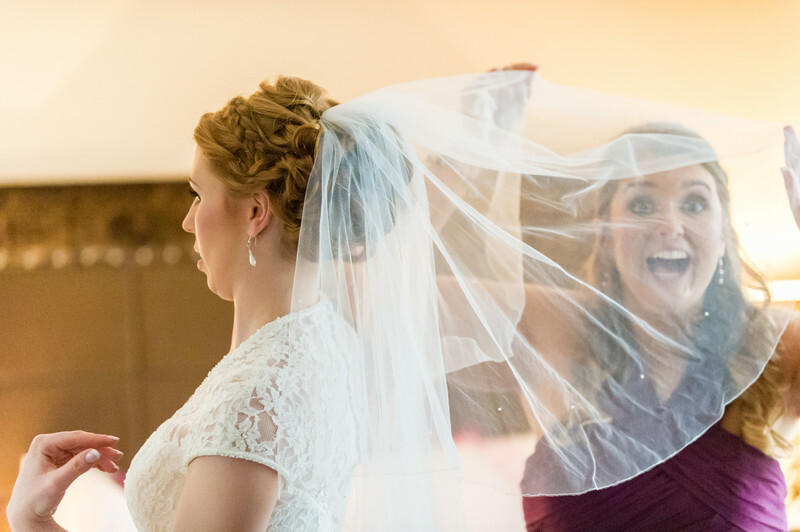 I was taking a series of images of Heather making last minute preparation in the Bridal Suite before going down for her Wedding when her bridesmaid decided to have some fun and gave me one of my all time favourite images! It is one of the sort of images I wish I could capture on every Wedding day but sometimes it is just the luck of the draw, I just consider myself fortunate enough to have been there and pressed the shutter at exactly the right time, it makes me smile every time I look at it! As one of my photography heroes Cliff Mautner often says "We are only as good as our clients", on this occasion we not only had fantastic clients in the form of Heather and Brett but a fantastic supporting cast of Bridesmaids, Groomsmen and family and friends. We must have impressed this Bridesmaid and her husband to be as they booked us at this Wedding having seen nothing more of our work than the odd sneak-peek at the rear LCD on the camera back between shots. We really loved photographing this Wedding, there was a real feeling of comradely between the Groom and his best men (all rugby players) and a special kind of friendship between the Bride and her Bridesmaids, a superb Wedding, thank you Heather and Brett!